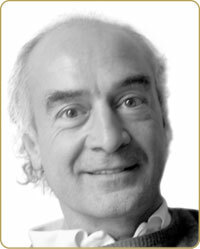 Jan was born in Helmond, the Netherlands, and since 1985 he has been practicing homeopathy. He has studied with many of the well-known homeopaths: Alphons Geukens, Jost Kunzli, Roger Morrison, Bill Gray and especially George Vithoulkas and Rajan Sankaran. Jan is famous for being one of homeopathy's pioneers. His is synonymous in homeopathy for the enormous advances and insights he has made with the periodic table and mineral kingdom. This groundbreaking work has been done with the categorization of materia medica into characteristic groups and endeavouring to find their 'essence'. This way of thinking about remedies as having 'essences' was first brought to prominence by George Vithoulkas. With great clarity and coherence Jan Scholten has brought to light the inner relationships of groups of mineral remedies and then later expanded this to give us a working hypothesis for the whole of the periodic table. Jan's idea of combining two remedy pictures (for example Calcarea and Sulpur) to produce a third and individual picture (Calcarea Sulphuricum) is know a common and popular practice among many homeopaths. Jan's latest contribution to homeopathy is his work on the Lanthanides that yet again takes the reader into previously un-chartered waters.